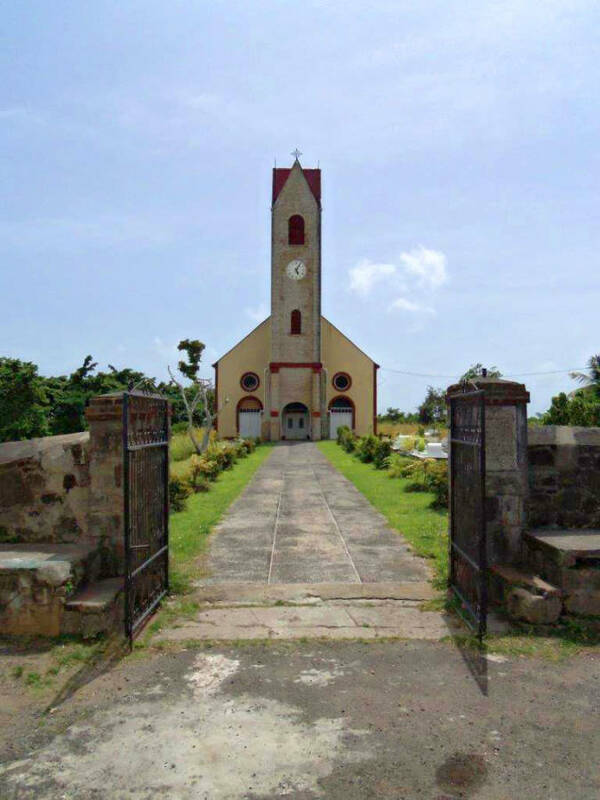 It was one of four churches started in 1830, including Anglican churches in St. Andrew and St. David, and the Presbyterian Kirk in St. George’s. 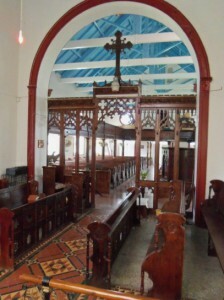 The cost of the construction of the Anglican churches was provided by a grant from the British Government in support of establishment churches. 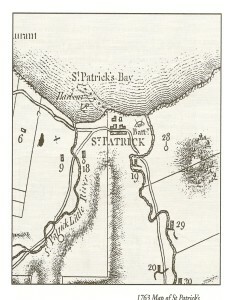 Excerpt from Pinel’s 1763 map of Grenada, showing the location of a battery over-looking the St. Patrick’s River. It would have also been the general area of the Notre Dame du Bon Secours Catholic Church constructed c. 1718 on the site of the Police Station ruins. The Catholic Church was appropriated by the Protestants for the use as an Anglican Church, but it was destroyed during Fedon’s Rebellion in 1795-96. It is most likely the historical site of Leapers’ Hill and not the celebrated site behind the current Catholic Church on the opposite hill. 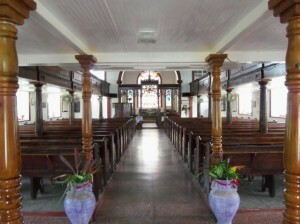 St. Patrick’s Anglican Church is the first and oldest Anglican Church constructed in the parish. It sits on the site of a coastal battery and palisade fort, Fort d’Esnambuc, built in 1650 following the French attack on the Kalinago at Leapers’ Hill. 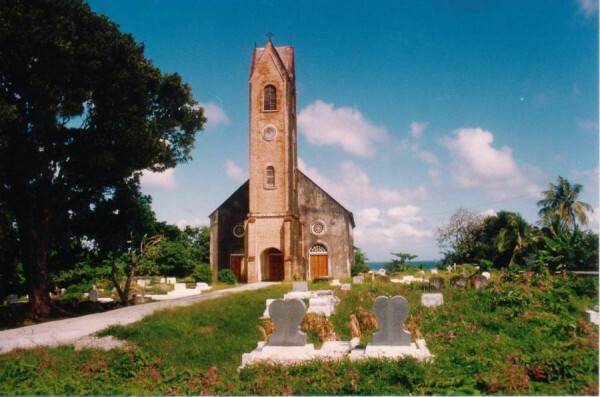 The present chapel was begun in 1830 and consecrated just over a year later on 21 July 1831 by Bishop Coleridge of Barbados and the Windward Islands. It is a handsome building tucked away on a picturesque hill overlooking the Caribbean Sea. Its architectural style is Caribbean Georgian, illustrated by the tall tower crowned with pointed quadripartite vaults and strengthened by superimposed buttresses. The façade has three doors, the two side doors with semi-oval windows above them. Surrounding the church is a cemetery with headstones dating back over a hundred and fifty years. 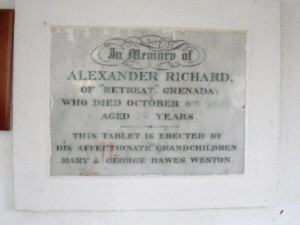 Historical parish records, including birth and death registers, were included under the combined parishes of St. Andrew/St. Patrick/St. David (1807–1825) and St. Patrick/St. David (aft. 1825), and later under its own; records date to 1807. It was beautifully restored following Hurricane Ivan in 2004. There are about a dozen memorial plaques on the walls, including ones to John Anthony McSween, George Augustus Gentle and George Paterson. The St. Patrick’s Anglican Church, c. 1992. The graves are overgrown with the ubiquitous bee vine or Mexican creeper (Antigonon leptopus).